Breathing in polluted air may wreak havoc on our DNA, reprogramming genes in as few as three days and causing increased rates of cancer and other diseases. So says a new study that tracked DNA damage in 63 steel-foundry workers in Brescia, Italy, who, under their normal factory conditions, were exposed to particulate matter. The same damage may occur in city dwellers exposed to normal air, the researchers say. 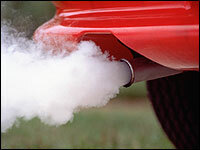 Particulate matter includes suspended, tiny bits of dust, metal, or soot in the air, which can lodge deep in the lungs. Exposure to the substance has been linked to respiratory diseases, lung cancer, and heart problems. Scientists know little about how inhaling particulate matter can cause health problems, according to lead study author Andrea Baccarelli of the University of Milan. But they did find that exposed workers’ DNA was damaged by a slowed rate of “methylation,” a biological process in which genes are organized into different chemical groups. Fewer groups means that fewer genes are expressed—or made into proteins—a crucial process in the body’s regular maintenance. Reduced-size gene groups like the ones observed in the new study have also been found in the blood DNA of lung cancer patients. In the study, the workers’ blood was sampled on the morning of the first day of their workweeks—before they were heavily exposed to the foundry’s air—and again a few days later. Comparisons between the two samples revealed significant changes in the methylation of four genes that may suppress tumors, said Baccarelli, who presented his research May 17 at the International Conference of the American Thoracic Society in San Diego, California. You might not have to be a steelworker to sustain this kind of genetic damage, Baccarelli added. It’s true that air near the steel foundry contains about ten times more particulate matter than ambient—or normal—air, and a larger fraction of foundry-air particles are metals. But the team speculates that the same damage can occur in city dwellers—the effects, however, take weeks or months to show up. For instance, Baccarelli has done previous research that shows elderly people in Boston had DNA damage from breathing in particulate matter. John Heffner is professor of medicine at Oregon Health and Science University and a past president of the American Thoracic Society. The new study strengthens the link between particulate inhalation and lung cancer, said Heffner, who did not participate in the research. “Other investigators have shown that inhalation of particulate matter affects DNA through the methylation process,” he said. Related work by Baccarelli’s team also raises the possibility that methylation damage from particulate matter can be slowed or even reversed with folic acid, a vitamin naturally found in many foods. The vitamin “may make methylation machineries more efficient,” lead study author Baccarelli said. KT: A study has just come out showing that although the French spend two hours eating each day — roughly twice as long as we do — they’re among the slimmest of the 18 nations in the study. Americans were the fattest, with more than 1 in 3 Americans qualifying as obese. How would you explain this phenomenon? What compels Americans to eat so many of our meals in our cars? JHK: Americans eat so many meals in cars because: 1) The infrastructure of daily life is engineered for extreme car dependency, and 2) because the paucity of decent quality public space and so-called third places (gathering places) for the working classes (and lower) — and remember, it is the working classes and poor who are way disproportionately obese. The people portrayed in Vanity Fair magazine are not fat. I suspect that the amount of time Americans spend in their cars is roughly proportionate to the amount of time French people spend at the table. Fast food is not a new phenomenon in the USA, however. Frances Trollope’s sensational travel book of the 1830s, The Domestic Manners of the Americans dwells on the horrifying spectacle of our hotel dining rooms, where people bolted their food with disgusting manners. Americans have been in a tearing rush for 200 years. WASHINGTON, DC, April 29, 2009 (ENS) – Six out of every 10 Americans – 186.1 million people – live in areas where air pollution endangers lives, according to the 10th annual American Lung Association State of the Air report released today. Most of the losses are attributable to 3,000 annual deaths, a Cal State Fullerton study says. The study underscores the economic benefits of meeting federal air quality standards. Most of those costs, about $25 billion, are connected to roughly 3,000 smog-related deaths each year, but additional factors include work and school absences, emergency room visits, and asthma attacks and other respiratory illnesses, said team leader Jane Hall, a professor of economics and co-director of the university’s Institute for Economics and Environment Studies. The study underscores the economic benefits of meeting federal air quality standards at a time when lawmakers and regulators are struggling with California’s commitment to protecting public health in a weak economy. “In the South Coast basin, an average 64% of the population is exposed to health-endangering annual averages of particulates,” Hall said, “and in the most populated county — Los Angeles — it is 75%. Hall agreed. “This is a drain that could be spent in far better ways,” she said. Guess who was contracted to do the report? RWDI. The same consulting group that has been waving their paper all over Canada for the TDL group (Tim Hortons) in defence of idling in drive-thrus. In Ontario, air pollution is a public health crisis, with thousands of premature deaths attributed to air pollution each year. To help the public reduce or modify their exposure to poor air quality, the Ministry of the Environment (MOE) monitors and provides regular updates on regional ambient air quality through its on-line Air Quality Index (AQI) (see http://www.airqualityontario.com). MOE’s 40 monitoring stations measure six key air pollutants known to be harmful to human health, including ground-level ozone and fine particulate matter (PM2.5). Unfortunately, Ontarians who rely on the government’s AQI may be lulled into a false sense of security about the quality of the air they breathe. MOE’s monitoring stations are intentionally located away from local sources of pollutants in order to provide representative information about regional average exposure to air pollutants; while MOE’s data is useful for predicting air quality on a regional scale, it does not provide information about local – “street-level” – air quality at any given location. Current reporting of air quality by MOE based on the AQI may lead Ontarians to believe that air quality on the streets is better than it actually is. To illustrate this concern, in the summer of 2007 the ECO asked air quality experts to monitor the air quality at street-level at a variety of locations across Ontario. The results revealed that levels of particulate matter were consistently higher at street-level sampling locations than at MOE’s equivalent AQI monitoring stations. For example, while street-level samples collected in downtown Toronto recorded concentrations of particulate matter equivalent to the AQI’s “very poor” category, MOE’s Toronto downtown AQI station reported air quality to be “good” at that time. The ECO sees a pressing need to overhaul Ontario’s outdated and inadequate air quality monitoring and reporting program to ensure that Ontarians have the information about air quality they need to make informed decisions. Poor air quality can cause a number of adverse health effects in humans. As summarized by Toronto Public Health (TPH, 2004), short-term exposure to pollutants commonly found in urban air can cause increases in respiratory symptoms, infections, emergency room and hospital admissions, and even premature death in some cases. Long-term exposure to air pollution can cause chronic health diseases, reduce life expectancy, and increase the risk of lung cancer (TPH, 2004; Pope, 2004; and Halton Region, 2007). For many years, both the Canadian Federal and Ontario Provincial governments have had programs in place to advise the public of air pollution episodes. These programs make use of both air quality measurements and computer-generated forecasts. For cost reasons, air quality measurement networks tend to be limited to a small number of monitoring stations in any urban area, all located away from major local emission sources, in places such as city parks. Measurements from these sites give information on the regional average exposure to air pollutants. Similarly, computer-generated forecasts are typically resolved at horizontal scales of several kilometres, because of limitations in computing power, and only provide information on regional average exposure. These measurement and forecast systems have proven useful to advise the public about large scale smog events, but do not deal with public exposure to pollutants at a local or street level. Large numbers of people in urban centres are exposed, at least for parts of their day, to air pollution at street level where vehicle emissions may be trapped in the canyon created by large buildings on either side. As such, the exposure to pollutants at street level is typically very different from the regional average exposure measured at monitoring stations and predicted by computer models. Due to the human, environmental and economic costs associated with poor air quality, the Environment Commissioner of Ontario (ECO) is interested in knowing how the current air quality forecasting programs in Ontario and the rest of Canada compare to those of other jurisdictions and to the state-of-the-science, in terms of representing the true air pollution exposure of urban populations. This information will allow the ECO to assess whether these programs are adequate for informing the public concerning exposure to poor air quality in Ontario. To assist with this initiative, the ECO retained RWDI AIR Inc. to perform the following tasks. • Review and summarize current air quality forecasting and ambient monitoring initiatives being implemented by the Ontario Ministry of the Environment and Environment Canada. Also, research and briefly summarize operational air quality forecasting and ambient monitoring initiatives used in other national and international jurisdictions. • Prepare a ‘Lay Language’ report (this report). Although the report contains some technical content, the focus is on presenting the information in brief and general terms. • At a workshop with the ECO, present the findings from this study and explore the approaches being used in Ontario (and Canada as a whole) in light of operational modelling and monitoring initiatives in other jurisdictions and the current state-of-the science. Incorporate into a final report the key issues discussed during the workshop and a list of recommendations for “next steps’. The daily exposure to free radicals from car exhaust, smokestacks and even your neighbors’ barbecue could be as harmful as smoking, according to a new study. 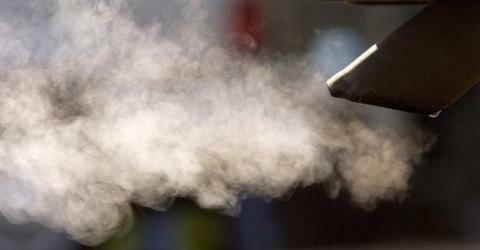 Many combustion processes, such as those in a car, create tiny particles that may act as brewing pots and carriers for free radicals — chemicals believed to cause lung cancer and cardiovascular diseases. The findings are from Barry Dellinger of Louisiana State University in Baton Rouge, who reported them August 17 in Philadelphia during a meeting of the American Chemical Society. Whether the exposure equates to smoking one cigarette or as many as two packs a day remains difficult to determine, he added. His team’s lab experiments — first described in the July 1 Environmental Science & Technology — suggest that noxious chemicals form on soot nanoparticles in the still-hot residue of combustion, for example inside a car’s exhaust pipe and catalytic converter. The chemicals are hydrocarbon-based free radicals called semiquinones. Similar chemicals usually degrade quickly if they float solo. But in this case, the chemicals stay attached to the nanoparticles, and they linger in the air for much longer than previously thought. “To our enormous surprise, the free radicals survive hours, days, even indefinitely,” Dellinger says. To mimic the conditions in car exhaust as it cools, Dellinger’s team used silica particles 100 nanometers wide and coated them with copper oxide. The team then exposed the particles to a hot gas — experimenting with a range of different temperatures — containing hydrocarbons typically produced in flames. All those ingredients are common in the exhaust of motor vehicles and factories. The researchers then examined the nanoparticles with magnetic fields tuned to identify unpaired electrons, the feature that makes free radicals highly reactive and potentially dangerous for living cells. The data showed a signature typical of free radicals and similar to that of semiquinone, a free radical found in cigarette smoke. The free radicals, however, only showed up when the initial ingredients had been mixed together at temperatures between 200 and 600 degrees Celsius. That means free radicals are unlikely to form during the actual combustion, which takes place at higher temperatures. Instead, they would likely form once the exhaust begins to cool down. David Pershing, a chemical engineer at the University of Utah in Salt Lake City, says the findings are potentially significant for human health. Dellinger added that more research is needed to determine not only where someone would be exposed, but also how much the body would absorb. The free radicals discovered by Dellinger’s team would not show up in ordinary smog checks, which detect molecules in the gas state and not those attached to solid nanoparticles, he said. Even the most modern catalytic converters may be ineffective at eliminating the free radicals. Ironically, even as a catalytic converter breaks down smog-causing pollutants, it may be creating conditions (particularly high temperatures) for the free radicals to form. “You could be destroying some [pollutants] and creating some at the same time,” Dellinger says. Lomnicki, S…. and B. Dellinger 2008. Copper oxide-based model of persistent free radical formation on combustion-derived particulate matter. Environmental Science & Technology 42(July 1):4982.